Liverpool ace Georginio Wijnaldum revealed his reasoning for joining the Reds over Tottenham after he revealed that he held talks with Spurs boss Mauricio Pochettino prior to making his Anfield switch. Dutch midfielder Wijnaldum joined Liverpool in the summer of 2016 for a fee reported to be £25m according to BBC Sport. Wijnaldum was a revelation for the Magpies in his only season with the club where he scored 11 goals from midfield, although Wijnaldum’s performances weren’t enough to stop Newcastle being relegated from the Premier League. After impressing in his debut Premier League season it is no surprise that sides lined up for the midfielder’s signature with Tottenham and Liverpool being in pole position to sign the former PSV Eindhoven superstar. “I met Pochettino when I left Newcastle. I just felt Liverpool wanted to come to an agreement quickly.” he told the Telegraph. 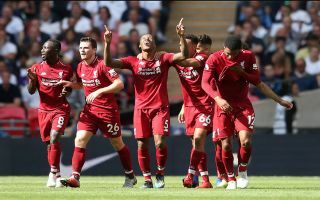 Wijnaldum’s decision definitely seems to have paid off with the dynamic midfielder scoring the first goal of his side’s 2-1 victory over Tottenham this afternoon. Wijnaldum has made 74 Premier League appearances for Liverpool and at the start of his 3rd season with the Anfield outfit it looks as though the midfielder is enjoying some of his best form to date. Wijnaldum has been instrumental in Liverpool’s flying start to the new Premier League season with the side winning all 5 of their opening matches. Wijnaldum has cemented himself in a solid midfield trio alongside James Milner and Naby Keita, with the side enjoying such a successful run of form the Premier League trophy could be in the hands of Liverpool at the end of the season.